On May 30, 2014, the final installation was complete on the DMR repeater operating on 443.5875 MHz. Thanks to Dave Meier (N4MW), Jay Lovelady (KD4BPZ), and the RATS Technical Committee for making this happen. The RATS DMR digital repeater is on 443.5875 MHz. The repeater output (after the duplexer) is about 20 watts. The antenna, a UHF Stationmaster, is fed by about 526 feet of 7/8 inch hardline. 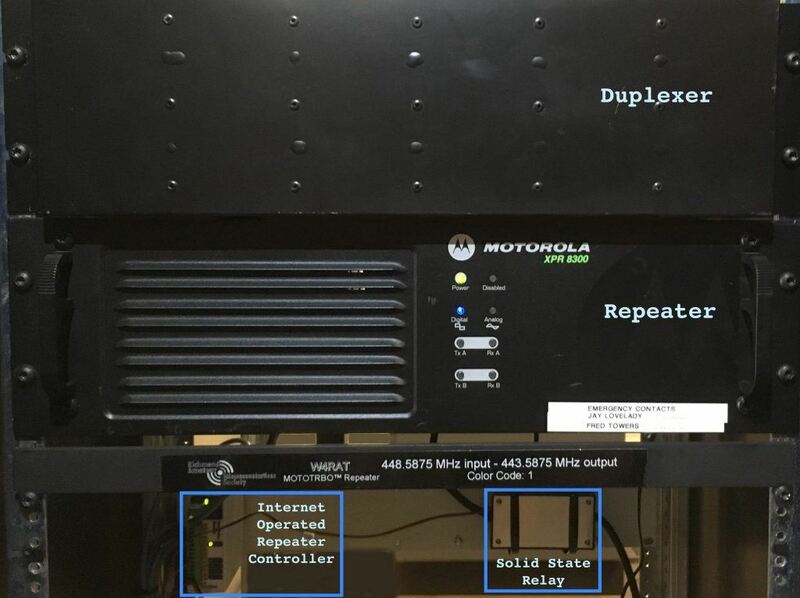 This repeater is a part of the DMRVA network. A UPS provides short-term backup power for the DMR repeater and Internet connectivity, and the entire RATS repeater system is serviced by a large diesel generator maintained by our host TV station. Check them out at: www.dmrva.org. Below are pictures of the rack containing the DMR repeater.